“You are learning to trust in your own instincts, to take your own journey without comparison to the life path of another. There is no need to become disheartened or distracted by comparisons or judgments. The earth needs your light, which can only come from you. You will offer so much less if you try to match your beauty to what you perceive the beauty of another. Many souls who are different and unique were not understood, acknowledged and valued for whom they were as children. Instead, they were encouraged to conform, to change, to be other than their true self in order to be loved. This can be a hard pattern to break. Yet the time is here for you to love and honour yourself as yourself. You are beautiful. You do not need to change for another. You certainly do not need to change for the Divine. You are being encouraged, instead, to distill your essence, to become even more of you. Hold your center, now, and do not be rattled by any other, through intimidation, confrontation, doubt, jealousy or fear. To ‘hold your center’ means you accept your innate value and worth, your right to exist and thrive and accept the love that created you as you in order to fulfill your divine destiny. This oracle brings you confirmation. You are on the right path. You do not need to collapse into fear or doubt to ease old guild or make others more comfortable. It is not selfish or ‘hard’ of you to be strong. You can hold yourself in high esteem and be gentle and loving to others, whilst absolutely refusing to accept any behaviour, belief or attitude of another that would tear you down or cast you into doubt or self-hatred. As part of your spiritual training, your soul learned to be open, to receive guidance and channel healing. This is what you needed to be able to do to function as a healer, channel and lightworker. You had to be sensitive, receptive and open. Now is the time to balance that with resilience, strength and even some divine stubbornness! Refusing to give up on who you are, whilst remaining open to guidance, is the balance of loving wisdom necessary to grow yourself as a divinely unique individual in a world that often fears true individuality – simply because it cannot be easily controlled. Holding your center doesn’t mean that you no longer surrender. Instead, you consciously choose to surrender into divine love and grow more empowered. This card is so much confirmation for me right now. The synchronicity is perfection. I feel like I have turned a corner, and yet I am not at all where I thought I would be. And I am not talking about physically… I am talking about belief systems and quite literally where I am at inside. I’m feeling rebellious. About pretty much everything. I’m questioning everything. I’m so tired of feeling like I need to do things a certain way in order to be… what… more spiritual? Ascending or ascended? I’m tired of worrying, wondering and analyzing my every move… on top of everything else going on in the world. From diet to lifestyle choices, to thoughts and feelings and actions I have been doing my very best to reach a certain state. And yes, I do think all that is important, but the vigilance is exhausting. What I am feeling right now is that more than anything we are being distracted. Distracted by the media. Distracted by the gurus. Distracted by technology and materialism and consumerism and veganism and humanitarianism and sexuality. The judgment. The labels. It’s all a huge distraction. What we are forgetting is that life can be simplified without all the fanfare, without all the judgment, and without all the labels. You can be you in the world, giving what you have to give. Offering of yourself and none of that stuff matters because it all comes naturally. Being the best that you can be without guilt or shame or guidelines. You fall into alignment with your authentic self because you want to. Because your heart leads you there. I got rid of my tv. Not that I am suggesting you do the same. But I was so tired of the noise of it. Tired of the distraction. Tired of the constant sales, the bombardment of biassed information. I’d rather look up and read or watch something that interests me. Meditate on it. Contemplate it all. I’m trying to simplify without guidelines. Yes of course eat healthy, organic and as raw and unprocessed as possible… but guess what… I have not reached perfection… I may never. I’m trying to drink more water; I stopped keeping track as it actually started stressing me out. I’m trying to exercise regularly. I’m trying not to beat myself up if I don’t manage to exercise because I’m so damn busy doing everything else I have to accomplish in a day. I’m doing my best. I am trying not to buy stuff I don’t need. I am trying not to be wasteful and recycle as much as possible. I am doing my best and I am tired of trying to add every single suggestion I read. I’m tired of feeling guilty if I don’t hit perfect ever moment of every day. It’s not about competition, it’s about coming together collectively. It’s not about who’s better but how we can assist those who need it. It’s not so much about the individual making it to the top, but the collective making it to the next level. Together. How did we get so far from that? How did we believe what they wanted us to believe. No longer. Shatter the illusions. The bottom line with all the ascension stuff is simple. Do your very best to be the best human Being you can be. Don’t hold grudges or anger against another, as it will crush your vibes. Be kind to the earth. Be kind to animals and all Beings. Be kind to yourself. Share your heart with your loved ones. Don’t compare yourself to anyone else; that is their journey, this is yours. Right here and now is all you ever really have. Enjoy as much of your life as you possibly can. Don’t let anyone tell you otherwise. Be loving. Tell the people you love that you love them. Hold the intention that your actions, thoughts and feelings be for the highest good of all… and when they are not, accept that you are human and try again. Forgive yourself and others. Offer gratitude as often as you can. We will all get where we need to be one way or the other; don’t judge anyone, offer them acceptance instead. Life is too short for all the games. It’s up to each of us to decide not to play. No one is your guru. Be your own. Set your intention to be the best version of yourself that you can be, and let the rest go. Don’t worry so much about it. Live from the heart and know that will always be more than enough. Oh I do love you and value all that you say .. it’s exactly where I’m at .. god bless you .. you are as perfect as u need to be as are we all .. it made me laugh when u said ” trying to add every suggestion u read” or words to that effect ..
Ok. That was awesome. I have been feeling the same way and just couldn’t express it. And, not sure who would want to hear it anyway. I’m in my 50’s – I’ve lived a life always pursuing perfection. Perfectly made beds, perfectly cleaned house, perfectly groomed, perfect perfect perfect and now I’m like – why do I need to be that way? I, too, have ALWAYS taken care of myself through healthy eating, exercise, spiritual practice (meditation, church, etc). Basically mirroring everything that you have said. Now, I’m seeing all this media and sales pitches (even in the ‘spiritual’ community) and I’m so tired of trying to ‘find’ who I am. Or make myself better. I need to accept that I’m pretty damn awesome! Thank you for this. I do hope that you get this email because I feel as if your post today truly resonated with me and I wanted to share it with you. I even printed it out and will keep it. I wanted to take a moment and say thank you! This one hit the nail right on the head. I started crying it felt like someone was reading my feelings out aloud and at the same time it felt like a hug from the universe! Thank you for the encouragement as well. A-HO!!! Hallelujah!! I’m with ya sister!! What a beautiful card and message! And your addition is always Ah-Mazing!! I can not say how much this resonates with me and the other commenters. I am physically mentally on another level. Literally the same path we are all walking on and growing on together each day. 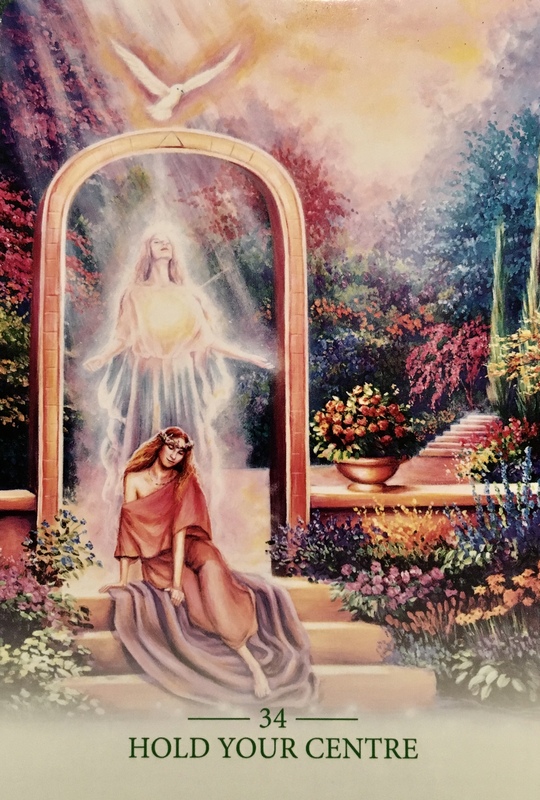 Card after card, day after day, challenge after challenge learning lesson after lesson… thinking what more do we have of ourselves only to find a burst of divine sychronicites perfectly awaiting us, revealing themselves in such energetic vibes! AH ! It’s emotions I am experiencing and absorbing and manifesting! I am more alive and my true self! Every moment is a moment ! Become aware of them and cherish them! Slow down ! Wow…you said what I have started feeling lately. I have been trying to fit myself into every box imaginable for my entire life…59 years now…and I finally decided I could not take that pressure any more. I am so tired of not knowing who I am and what the hell I am here for. The only things that bring me joy are my two sons…that is great but also sad. It is my turn to live and I am going to try really hard to do that. Thank you for saying what I have felt for so long now. That’s beautiful and authentic, truth and integrity. Good for you! Thank you Dee. This helped me today when I feel as lost as ever and not sure what to do and where to go from here, and yes, scared. But one day at a time and doing the best I can.